Having EDM-profiled South Africa in 2010 and India in ‘11, Richard Durand – globe-circling deck-master extraordinaire – is closing in fast on his third Sunrise. There can be few better places to find it than the land where the sun comes up first: Australia. Given unprecedented access to the future anthems vault of Black Hole Records, and a dozen other labels besides, Richard has compiled and mixed the best of their best into two new entrancing ISOS mixes – ones that will propel you headlong into summer 2012! ‘Australia’ represents the 10th edition of the series and to honour that occasion, Richard has conceived a very unique twist, just for this album! Audibly evoking Australia’s musical legacy inside its very first minute, Durand’s search begins with purpose-produced intro overture, ‘Velvet’. With the murmur and hum of the didgeridoo still hanging in the air, mix-1 slips into Eximinds’ super-caliente’ ‘Sunrise 6AM’ and ‘Paint the Sky’ – Richard’s first co-production with Pedro del Mar. From there, across two discs and 146 minutes, Richard skillfully plots the course for his latest Search. Utilizing ISOS’s well-known constituents: melodic, tech and upliftingly toned trance, he blends them with deeper progressive sounds. Giving maximum musical latitude to the album, he also binds subtle shades of house and electro in along the way. The harmonic strains of numbers like Mike Saint-Jules & Basil O’Glue’s ‘Nova Flare’, Karanda’s epic ‘Titan’, Easton’s angelic ‘October Sun’ and JPL’s summer-beckoning ‘Frolic’ infuse the mixes with thermally rising seaside ambiance. As ever vocals play their vital part in the ISOS dynamic. Super8 & Tab and Jan Burton’s current floor decimator ‘Black is Back’, ‘Letting Go’ by Spain’s Dimension and Emma Hewitt’s ‘Miss You Paradise’ all position the vocal centre-stage in the first mix, while on the second, lyrical touches come from Betsie Larkin and Rasmus Kellerman. Continuing to build the ISOS picture, more trance-progressive soundscapes are brought in, adding deeper contrast to Richard’s mixes. Sunny Lax’s ‘Maono’, new Alex O’Rion productions ‘Satellites’ & ‘Blueprint’, Norin & Rad’s lean, mean ‘Zion’ and Richard’s own ‘In Motion’ all give more mood-filled, atmospheric sequences to the mixes. Mix-2 culminates with the thunderous big room audio-assault of Orjan Nilsen’s ‘Endymion’ and the instrumental version of Marc Simz’s rapaciously uplifting breath-stealer ‘Out of Sight’. That is typically where previous ISOS chapters have come to a close. But for one edition only though the design is being changed! To commemorate its historic 10th chapter, Durand wanted to find a unique way of celebrating its achievements. For the first time this has given rise to a 3rd disc. Richard goes on to explain… “It’s an incredible feeling being the ISOS compiler/mixer – an experience I’d like each and every person to be able to share. That’s never going to be possible of course, but when Black Hole suggested as part of the 10th release, we did an ISOS all-time classics disc, I did feel there was a way in which I could make it happen for at least one other DJ”. On being given the news of his win, Thomas said: “I’m hugely excited to have won this competition! I really wanted to contribute the perfect selection of classic In Search of Sunrise tracks. For me ISOS reminds me of summer, the beach, happiness and tasty cocktails, so I wanted to capture that atmosphere. I think by using a lot of beautiful vocal tracks and the fact that mine was a live mix, it helped me to catch ISOS’s completely unique feel. 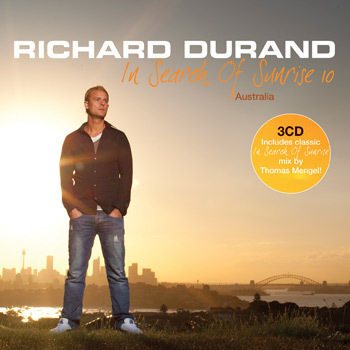 In Search of Sunrise 10 – Australia mixed by Richard Durand and featuring bonus ISOS classics disc from Thomas Mengel is released on June 11th through Beatport and iTunes on June 18th. 01. Pink Elephant – LAX. 07. Mads Arp featuring Julie Harrington – Slow It Down (Mathilda Mix). 12. Mark Norman presents Celine – Colour My Eyes.